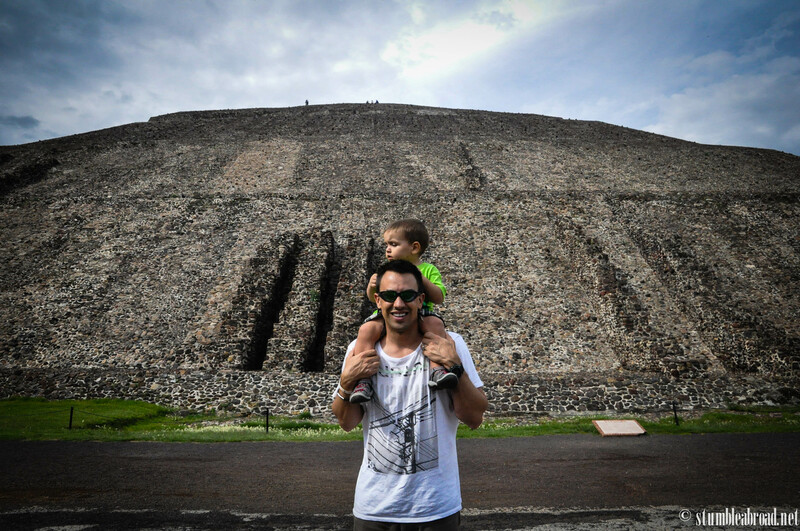 After a few days in Mexico City and Riviera Maya it was time for us to head back to Monterrey. 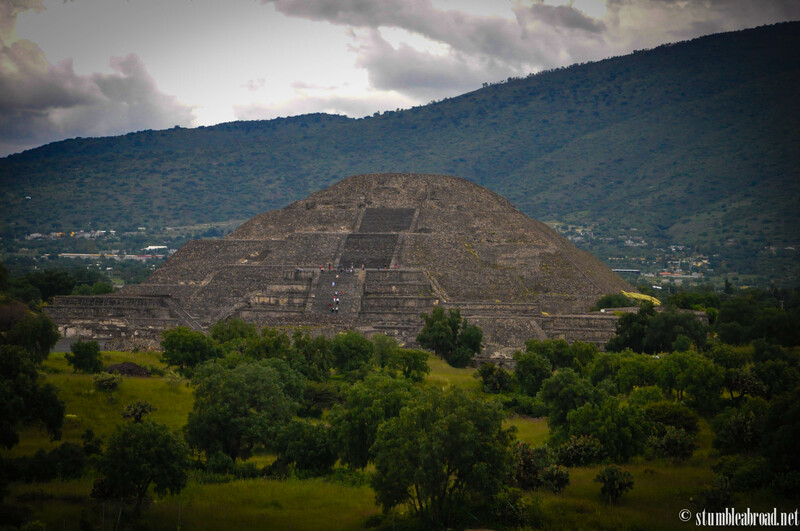 To be completely honest I knew that my hubby wanted to visit the pyramids by Mexico City but I had avoided the subject and hoped he would kind of forget about it. After all, we had just seen the gorgeous UNESCO heritage site of Tulum a few days before. 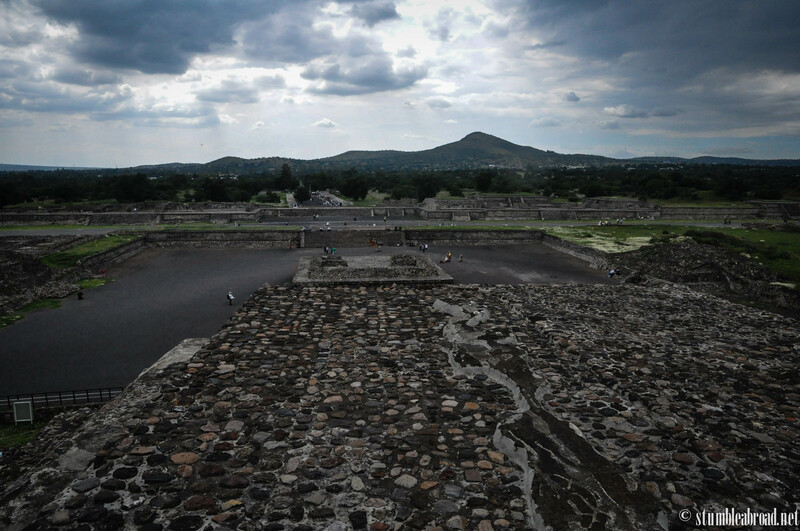 Despite my efforts to dissuade my boys to visit Teotihuacan, the four of them (hubby, dad, older son, younger son) ganged up against me persuaded me into adding this historical site to our already busy schedule. So on the day we were leaving we decided to go to the pyramids. A few wrong turns and what seemed like a very long ride later we arrived in Teotihuacan a short two hours before closing time. We were all starving so we were very happy to see that the array and variety of restaurants was plentiful. Naturally, we had to stop at the restaurant with the best playground according to the little munchkins and ended up in a very nice fonda which offered cold drinks, delectable dishes and a fun play area for the kids. 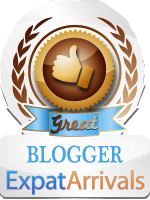 I am pretty sure all the restaurants are similar in what they offer and in the prices but I was happy with our choice. A few tacos and oh so many chips later we finally made it to the pyramids. The entrance fee was 57 pesos for adults. Kids went in for free. The hubby made a pit stop at the museum on site and was very surprised to see how informative and well-kept it was. If time had allowed I think he would have stayed there for hours and read every single sign (and in case you are wondering, yes, this is one of the reasons I fell in love with my nerdy hubby). I decided to not go to the museum since the kids were tired of sitting in a car so I let them roam free in the vast grounds by the pyramids. 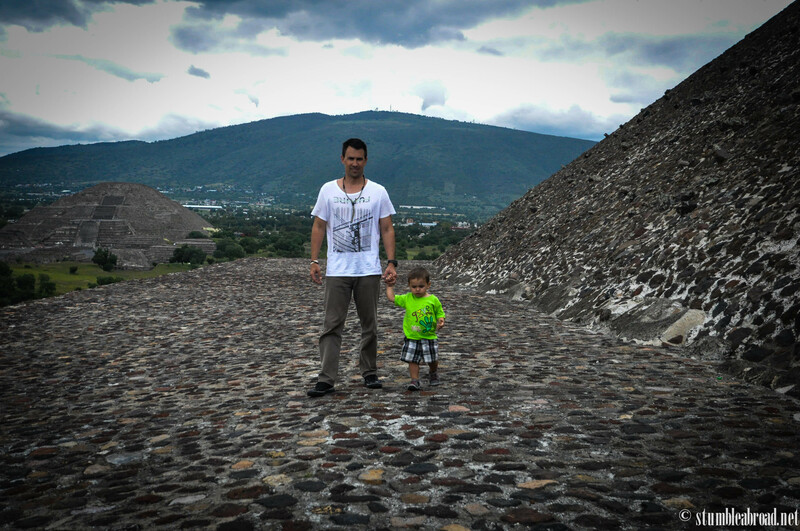 As soon as daddy joined us we headed over to the first pyramid and started the steep climb. 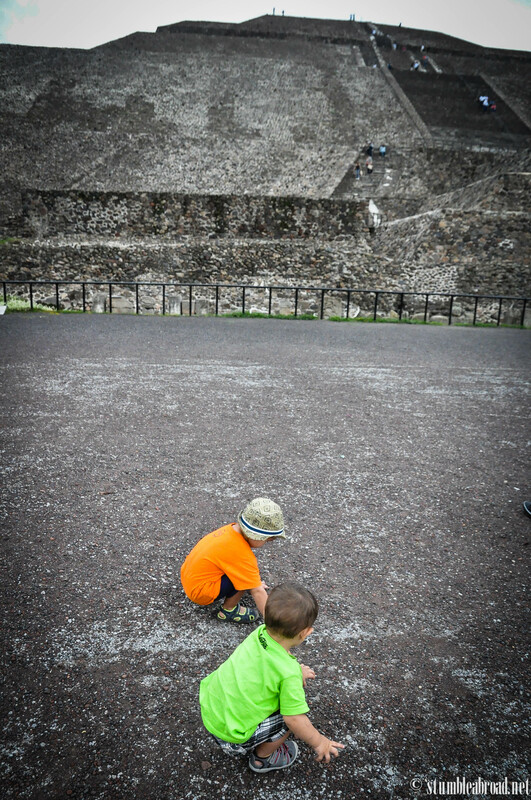 There are several sections of the pyramids and we thought reaching the first level would be quite a feat with the two monkeys in tow. So when we got to the first level we were still breathing so we decided to go one more level. 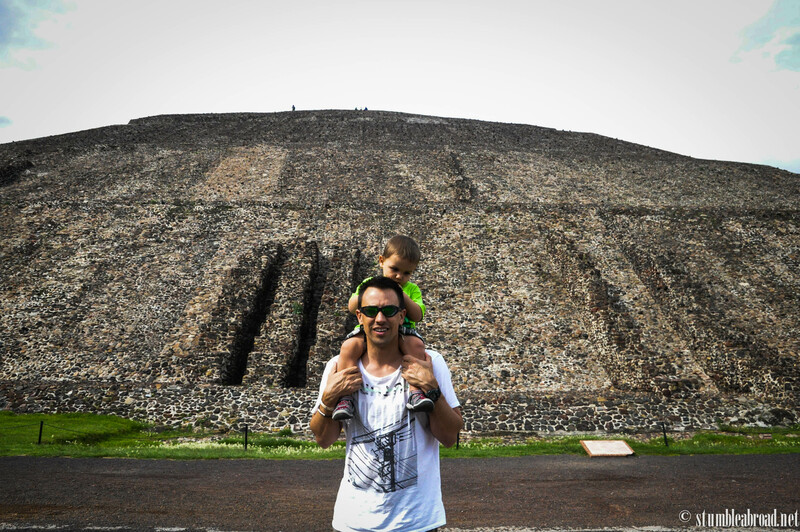 The hubby carried Josh up the pyramids and I climbed up behind Evan as he went up like superheros do, at the speed of light and to the awe of all surrounding us. I had to tell him to slow down several times. He was going way to fast and his agility was something I knew I could not match. 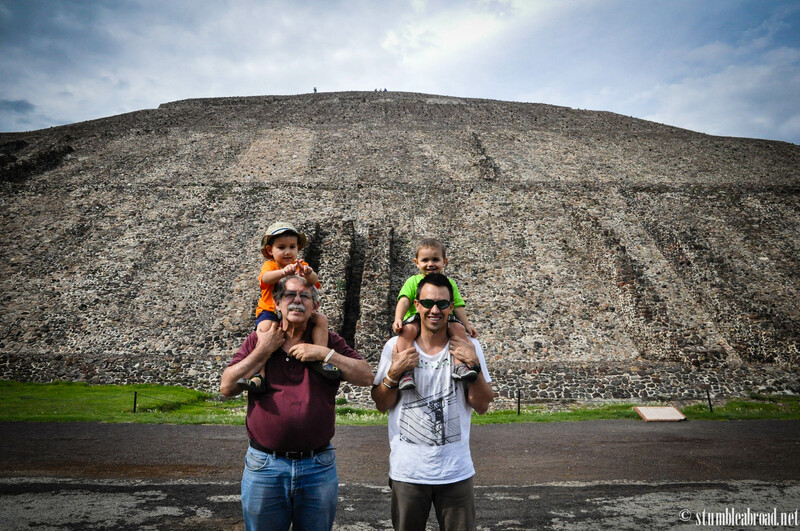 As we reached the second level of the pyramid we were happy to be here. I was so happy that my reluctance didn’t stop my family from insisting on visiting this place. It reminded me of so many other visits I have paid to this place with friends and family and I was glad the boys got to see another unique piece of Mexico. 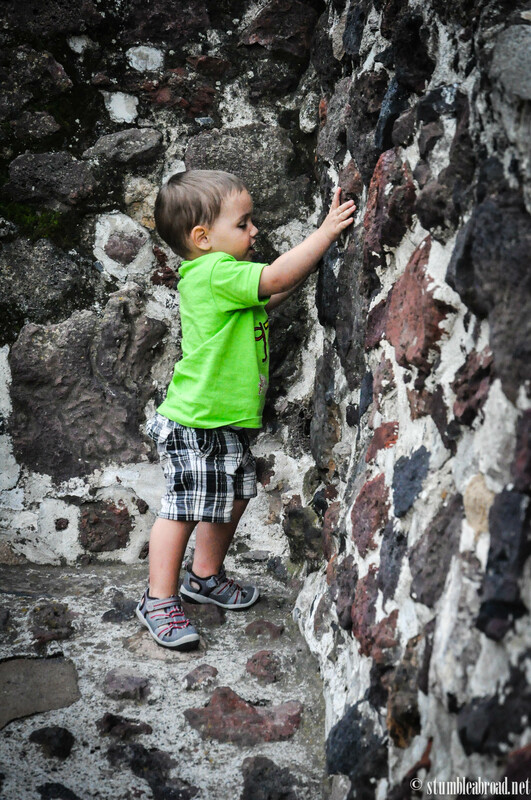 Evan was an amazing little climber! 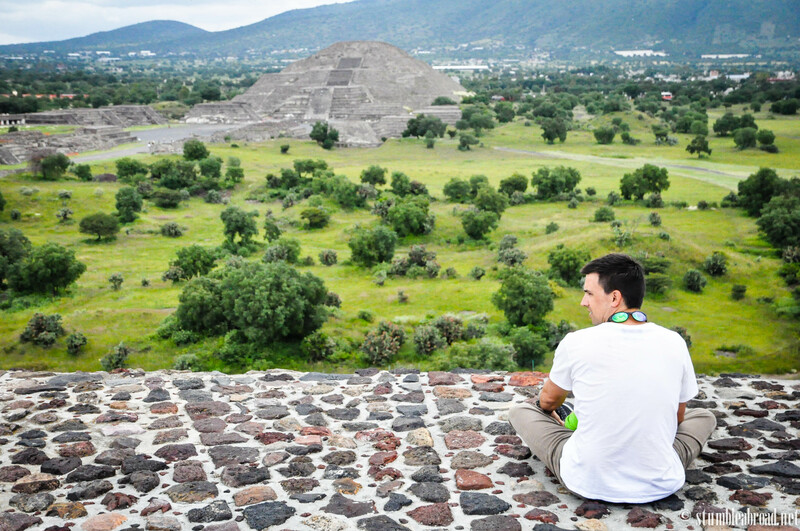 Since we didn’t have the time (or energy) to visit the other pyramid we were happy to see it from the top. The weather was perfect and we didn’t really feel too exhausted. 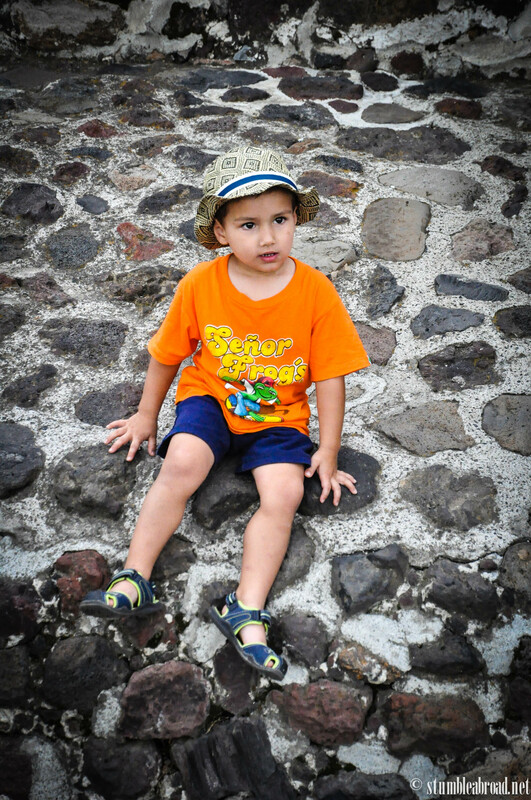 We needed to watch our time since we were driving up to San Luis Potosi but we enjoyed our visit nonetheless. As we were getting ready to leave the boys enjoyed running free and going a bit wild. Of course they found things to play with and had a good time just running around. I thought to myself I would have to bring them again in a few years and actually explain to them the history behind this wonderful place. 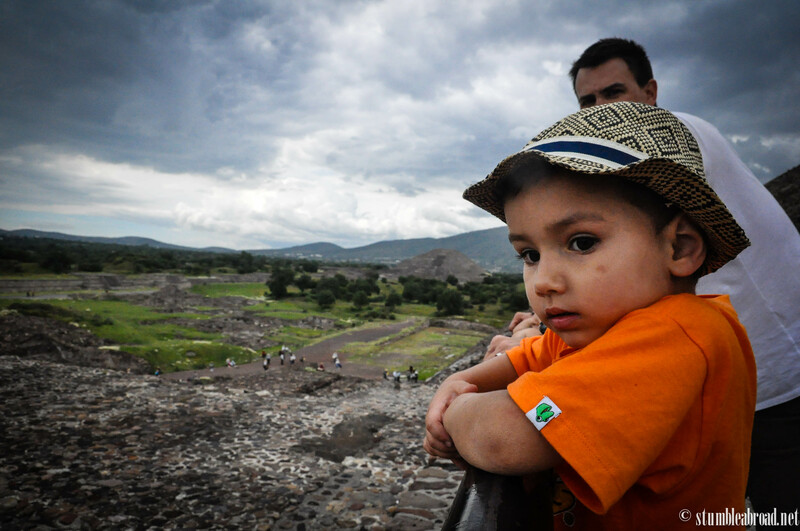 Teotihuacan is a great place for little ones. 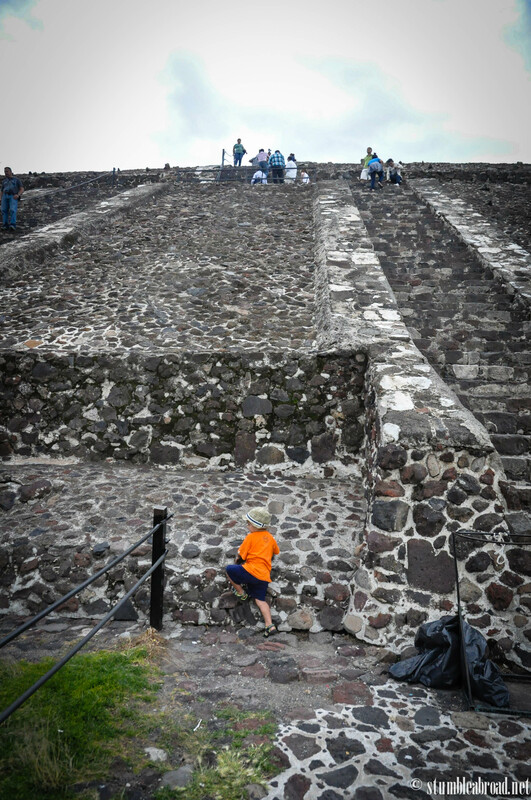 You have to be careful with the steep climb up the pyramid but the place is just a phenomenal site that allows kids to exhaust their energy levels by running and climbing. 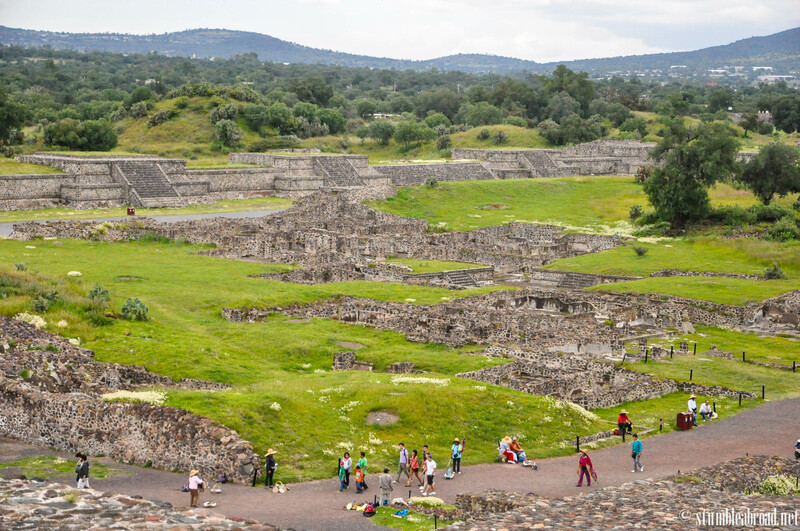 If you are in Mexico City you should really make the effort to go there, it’s about an hour drive from the city and it is a fabulous day trip. Come hungry! There are tons of great restaurants on site. Literally, dozens and they are numbered. I think most of them offer similar fare and many of them have special deals where they offer you a free beer or agua fresca if you bring a flyer with you which will be handed to you by people at the entrance. Most of them have playgrounds so you can be sure you will have a relaxing time while the kids play and you sip your Michelada. Most restaurants take cards but I would consider bringing enough cash just in case the system is down. Allocate about 4 hours to the visit. 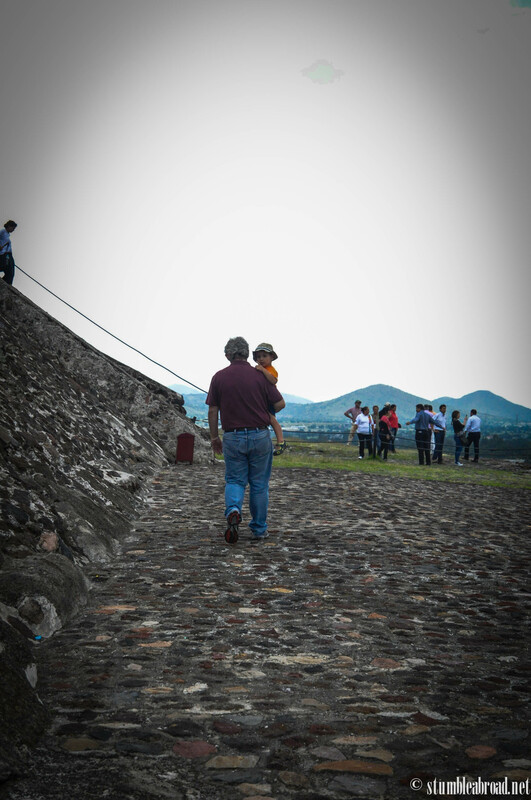 You can take your time visiting the museum and if you want to visit each of the pyramids and structures you will need plenty of time to walk around. This place isn’t exactly stroller friendly. There is gravel everywhere so it’s hard to push strollers around. 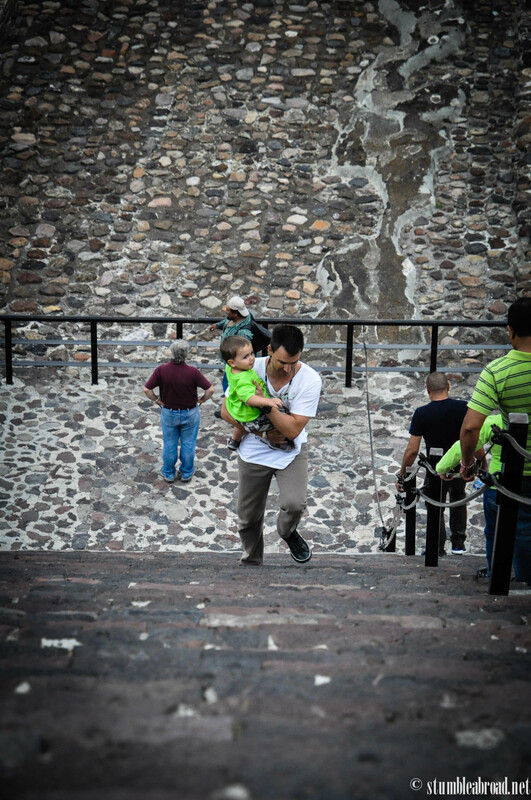 On the other hand you don’t want to haul your stroller up the pyramids. 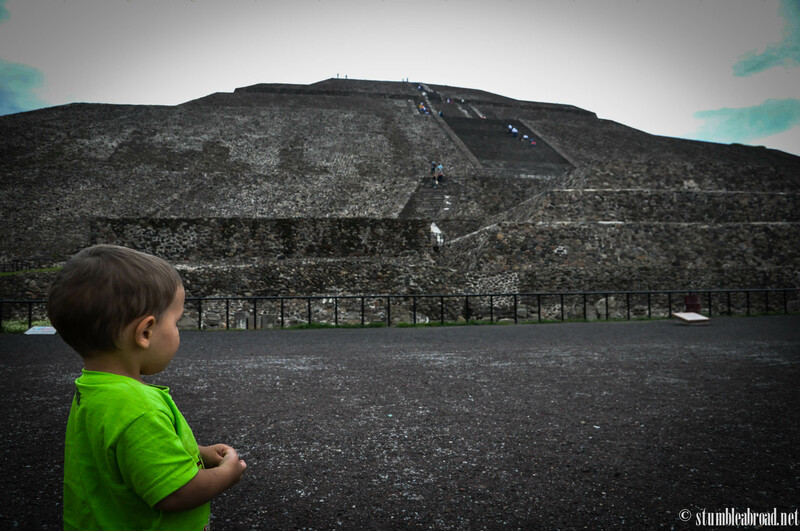 I would go for a carrier or an all-terrain stroller that you would have to leave at the base of the pyramid. You can hire a guide to explain all of the different structures. When kids are old enough I think it’s worth it. There are tons of vendors inside the site and by the parking lot. You can find some neat stuff including nice silver jewelry. Just make sure you bargain until you get a good price. What great travelers your boys have become! It looks like an amazing place to visit! Thanks, Kaho. Evan is definitely a great little traveler. Josh is still learning, you know what boys are like… 😉 Miss you! They both seem to be great. Josh is still tiny, but seeing his big brother, I have no doubt he’ll be a great little traveler as well! Miss you bunch!